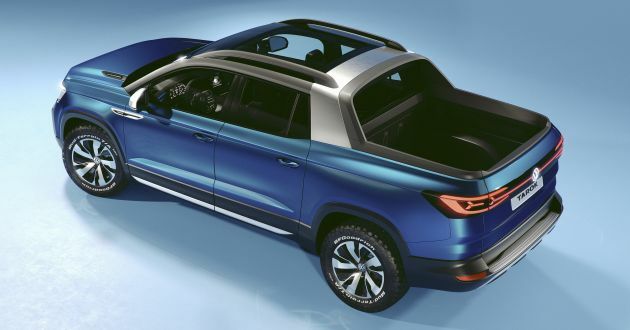 Volkswagen has once again shown the Tarok pick-up truck concept, this time at the 2019 New York International Auto Show. The pick-up concept first made its debut at the Sao Paulo International Motor Show last November. Let us remind you, if you like what you see here, you’ll be glad to know that Volkswagen would make “barely any changes” to the Tarok’s design from concept to series production. Now, the MQB-based truck measures about five metres long and features distinct pick-up cues like a double-cab body and a rear bed for storage. What’s rather unheard of is that the rear seats can be folded down, allowing extra-long items like a surf board to be placed in the back. Other exterior styling elements include a front end inspired by the Atlas Tanoak, sunroof, LED lighting, roof bar and sculpted sides. Inside the cabin reveals a modern dashboard with a digital instrument cluster display, glass-covered 9.2-inch touchscreen infotainment system, digital air-conditioning controls, and Cypress Metallic dashboard trim. Interestingly, the concept also features a full glass panoramic roof! You’d realise by now that the Tarok is more of a lifestyle pick-up truck than an all-out workhorse – it has a one tonne maximum payload. Under the bonnet is the ubiquitous 1.4 litre four-cylinder TSI engine that makes 150 PS, with drive going to all four corners via a six-speed automatic gearbox and permanent 4Motion all-wheel drive system. Five drive modes are available as well, those being Comfort, Sport, Normal, Eco and Individual. When it enters production, a 2.0 litre TDI engine will be added, delivering 150 PS as well. The automaker has yet to reveal when the Tarok will go on sale, and its debut at the New York show is primarily used to gauge market reaction for a “versatile and compact” entry-level pickup. What are your thoughts on the Tarok? Would you like one? Does being sought after and commanding ridiculus price after 15 years means game over? Ladder frame makes it feel like any other run of the mill pickup and doesn’t ride well too. This is supposedly made for comfort and lifestyle activities. Come here sure kena “Tarok”. Looks like a Tiguan with the rear chopped off. Hyundai already created a prototype of this concept. The question is whether it will go into production at all. Yes, i want 1 minus the AWD. This will makes it slightly cheaper and more efficient. Its not going to be as capable as a proper 4wd and not going to be driven on rough terrain so might as well drop the AWD for our market….that is, if it ever get here.